This week, we feature two audios with y’all. 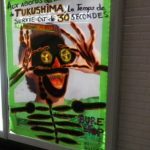 The voice of a prisoner in SC as the 2018 #PrisonStrike ends and someone resisting Nuclear Waste in Bure, France. First, “J” is in segregation in a South Carolina prison. He does not give his full name or the prison he’s inside for reasons of personal safety. You’ll hear him share a bit about his experience of the prison strike from the inside, the repression of prisoners at his facilities, prisoner unity in the strike,the high costs of living in prison and poor quality of food and other goods available and the red herring of administration that cell phones are the cause of violence. He shares condolences for families of those who were killed at Lee Correctional, the guard-instigated violence in April that sparked the call for the Nationwide Prison Strike. J also shares his thanks of outside supporters who have demonstrated outside of his facility, IWOC in particular and those who’ve helped to carry prisoners words around the world. To hear updates on the strike, again, we suggest y’all check out prisonstrike.com and the sites it links, as well as recent episodes of the IGDpodcast, The Hot Wire, Kiteline & Rustbelt Abolition Radio, all members of the Channel Zero Network. After that, for the bulk of the episode shares words from Daniel, who is involved in resistance to the building of a nuclear waste storage facility in the Gran Est (formerly Alsace-Champagne-Ardenne-Lorraine or ACAL) region near the French border with Germany. This infrastructure mega project threatens to poison the ground-water that feeds Paris, poison the ground in Gran Est and for villages like Bure where Daniel is based, and the resistance to the CIGEO storage facility has been met by harsh government repression and a heavy response police response. Daniel talks about the energy infrastructure in France, the military and colonial connection with the fuel of Uranium, comparisons to the ZAD at Notre Dame de Landes in Western France, resistance to other damaging power sources like in the Hambach Forest against a huge lignite mine in Germany and a few words about anti-pipeline struggles in the U.S.
We experienced some technical difficulties during the Bure interview, so for about 15 minutes there is a buzz. We hope that you will power through and listen carefully through the audio because the information is very interesting. After that time, it clears up and Daniel is far more listenable. Here are a few references Daniel makes, such as the Tarnac Case, the ZAD (our interviews on the ZAD) , Hambach Forest (including interviews by crimethInc and us). The deforestation may happen this autumn, so actions in Bure (which is bristling with police who detain and inspect people). You can find out info in French at https://vmc.camp (most updated) that can be put through a translator or a less-updated English-language version at https://en.vmc.camp or one in German at https://de.vmc.camp that’s slightly more updated. And Unicorn Riot did a piece last year contextualizing the ZAD NDDL, Hambach Forest resistance and struggle in Bure. Check out the IGD article to see the full, article. The prominent voice featured in last week’s episode of The Final Straw, the political prisoner Kevin Rashid Johnson, is being threatened with another punitive transfer because of his organizing and speaking out. There is a hearing on Monday, September 10th in his prison in Virginia, the state in which he was captured before being transferred away. His past transfers have moved him further from his family, have resulted in beatings, medical neglect, threats, starvation other attacks by prison officials and other prisoners. It would be awesome if you, dear listener, could take a moment to call and email tomorrow starting at 9am eastern time to the official in charge of interstate compact: Chief of Corrections Operations David Robinson. We can call the main office number at 804-674-3000 and ask to be transferred to his phone line. Robinson’s email address is david.robinson@vadoc.virginia.gov. The Ceratin Days: Freedom for Political Prisoners Calendar is a joint fundraising and educational project between outside organizers in Montreal, Hamilton, New York and Balitmore, in partnership with a political prisoner being held in maximum-security prison in New York State, David Gilbert. Co-founders Robert Seth Hayes and Herman Bell were released from prison in 2018. The proceeds from Certain Days 2019 will be divided among these groups: Addameer Prisoner Support and Human Rights Assoc. (Palestine), Release Aging People in Prison (RAPP) and other groups in need. Check out our interview with former Political Prisoner, Daniel McGowan, about the Certain Days calendar. The City of #Asheville just dropped their notice of violation against the 12 Baskets food distribution project out of the Kairos West community center, however is still retaining it’s attack on Steady Collective’s needle exchange, noloxin distribution and harm reduction program by an unprecedented challenge to Firestorm’s hosting of the project via claiming that Firestorm is operating a homeless shelter by hosting Steady Collective. This is idiotic. Distributing harm reduction tools to the public saves lives and providing a space for people to sit, read, access reading materials and the internet does not amount to a shelter. If you haven’t heard the issues, check out our August 12th interview with Hill Brown of Steady Collective and keep an eye on their social media presence as well as that of Firestorm. Also, consider a visit to their public event every Tuesday at Firestorm from 1:30 to 4pm. On Thursday, September 20th at Firestorm Books & Coffee in West Asheville, NC, Blue Ridge Anarchist Black Cross will be packaging mail for prisoners. No experience needed, just show up ready to fold and address and stamp materials. Snacks and good company will be provided!